Courses designed to develop valuable knowledge and practical skills. Are you stuck in a rut at your job? Do you find that you want to do something that matters but can’t decide what you should do? Careers in the health sciences are an excellent way to feel like you’re making a difference in the lives of others and do something you enjoy that pays well. At Northwest Suburban College (NWSC), we offer a variety of Allied health certificate programs so that you can choose something that meets your needs. We are located in the Chicago Suburbs IL, and we’re a small college with a personal touch environment. The students here enjoy the facilities, which include libraries, comfortable lounge, meeting rooms, science labs, and three computer labs. Take the NWSC "Allied Health Career Training Readiness Quiz"
Of course, hands-on knowledge is essential at health sciences colleges. You need to learn the basics and how to apply that knowledge so that you’re prepared for your new career. We offer many service projects throughout the community, but also provide externships at hospitals, healthcare facilities, and clinics. If you’re looking for health sciences schools, you probably want something close to home; if you live in Chicago, we’re located in the suburbs and likely give you a short commute. Whether you’re continuing with your current job, have family responsibilities, or don’t want to travel far, we’re conveniently located close to you. While we believe education is priceless and essential, we understand that potential students need to know the financials to make sure they can afford it. Most of our students are adults; they juggle a variety of financial responsibilities for their families and homes. We make it more affordable to attend school. Scholarships are also available. If you’re ready for a new career, fill out the application to apply. At Northwest Suburban College, we are committed to fast-tracking our students to their career paths and potential income through accelerated courses. Time saved going to school is time that can be invested in your career, accruing an income and work experience. Graduating with a certification that is closely aligned with job requirements in the industry of your interest improves your success-rate when seeking employment. On campus, we offer updated classrooms and fully equipped laboratories, where innovation and leadership in the healthcare fields are encouraged. There is always a nook for quiet study time in our library and room to gather for group projects, right on site, in our comfortable lounge; all this in a compact, small-college environment. Our many community service projects, and access to externship opportunities in clinics, hospitals, and other healthcare facilities, further enhances the hands-on knowledge our students acquire. Would you like to broaden your horizons with personalized instructor attention, where coursework almost feels customized to your needs? Do you thrive in a small college setting conducive to the exchange and cross-pollination of ideas? Do you want to build your network of professional contacts while learning from peers whom you know on a first name basis ? If you answered yes, NWSC is right for you. A majority of our students are adult learners, juggling myriad financial responsibilities including a home and family. At NWSC, we are committed to providing our students an opportunity to learn at an affordable price. Use the Net Price Calculator to see what it would cost you to attend NWSC. We offer scholarship opportunities to all of our students. Conveniently located in the suburbs, and easily accessible by I-290, attending NWSC also means a shorter commute to work and home, your children’s schools and childcare, leaving you with more time for the things that matter the most. There is no better time than the present to create a better future. You can get enrolled in less than a week. Start now by filling out the application and calling or emailing our friendly admissions staff, to learn more. We hope to see you soon at NWSC! 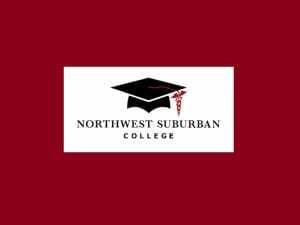 At Northwest Suburban College, our mission is to provide high quality, accelerated, and affordable education in professional and paraprofessional fields that will lead to scholarly pursuit and gainful employment opportunities. Offer curricula-intensive preparation for entry-level positions in various fields and the groundwork for success in an ever-changing work world. Provide career guidance to produce realistic goals and aid in understanding current job markets. Foster externships with clinics, hospitals, and other healthcare facilities to develop training of our students and employment opportunities for our graduates.